Put your hands on the rails out in front of you and push down, as if you were doing a push up. 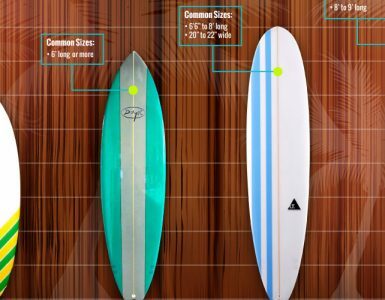 This should sink the nose of your board underwater. Keep your arms straight and lean forward to help get more of the board under the water. Place a foot or a knee on the board and take a breath as you submerge your entire board underwater, just as the wave is about to roll over you. Keep your board angled downwards and lay flat. 'Scoop' or arch your board and your body under the wave. Aim your head and the top of your board at the surface just behind the wave. As you emerge from the water you should be in position to start paddling again. As the wave approaches, paddle towards it and roll your board over on top of you just before it reaches you. Pull the board down towards you, trying to stay upright/vertical in the water with the board on top of you. This should form a "T" shape and allow you to act like an anchor. Pull down and thrust your board forward through the wave by kicking against the water. Once the wave has passed over you, flip your board back over, climb aboard and resume paddling! These two maneuvers are just like everything else. That is, they will become second nature to you once you have practiced over and over. The timing and execution will become instinctive. The break zone is the threshold to the deeper, calmer water where surfers can wait for a nice unbroken wave to ride. Moreover, it is the area that will test the surfer’s mettle in negotiating the way out. 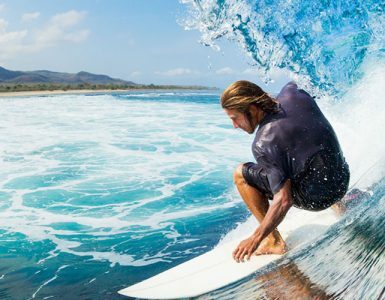 You should only start to move through this zone once you are comfortable your board and paddling technique as well as your ability to push through, duck dive and turtle roll. Once you’ve made your way outside the breakers, take a moment to observe where you are in the lineup. The lineup generally refers to the line of surfers waiting patiently for a wave. It can also be called the takeoff zone or peak. Beach breaks often have several peaks where waves will break. Accordingly, you as the Gremlin should steer clear of the more experienced surfers and find a more remote spot with fewer surfers as you probably will be wasting quite a few waves. Experienced surfers don’t mind beginners as long as they don’t act like a kook and become a nuisance. Now that you’re sitting outside at an appropriate peak, sit up on your board and point yourself out to sea. Note how the waves come in sets and lulls, and how steep they are where you’re sitting. Learning the rhythm of the ocean takes time, and the ocean will have a different rhythm every day. It’s a good idea to just take a few moments to assess the mood of the ocean once you’re on the outside. After studying waves all the way from the horizon to the break zone the next step is to start to paddle and build momentum from the surging swell. Identify a wave on the horizon, turn your surfboard around and face directly into the beach. As the wave approaches you should start to paddle, keep looking forward but also have glances over your shoulder so you know the position of the wave, when you feel the surging swell lift the surfboard, increase your paddling speed and power, so you gain momentum and start to surge forward with the wave. At this time, you should push up and surge to the edge of the break zone where you can look over the edge of the wave as it start to break. It is important to understand where the wave will break, you do not want to paddle all the way into the break zone and into a position where the wave is breaking on top of you. Surging with waves will teach you to build your paddling speed to gain momentum and match the speed of the wave. Timing and positioning is the key to catching green waves and it is very hard to perfect this until you can ‘feel’ the surge from the wave. After you are comfortable identifying waves, building momentum and surging to the edge of the break zone, the next step is to paddle on to the wave, stand up, and take the drop. While surging keep paddling a few more strokes than you have been, when you feel the wave start to steepen (peak) this is when you should jump to your feet. It is important to take the wave a little bit further than you have been before standing up, if you stand up too early the wave will leave you behind. Once you have jumped to your feet, keep your knees bent, head up and surf! Before you know it the aspect of catching the wave will become second nature to you…So With the proper practice and patience you will be a shredding in no time! You are going to fall off. To begin with, when you fall off you should always cover-up. By placing one arm over the front of your face and the other across the top of the head will help prevent your surfboard or another surfers surfboard connecting with your head when you fall off. When you fall off you will most likely end up underwater, at this time you should cover up and remain covered up until you have broken the surface and become aware of where your surfboard is and if there are any other waves or surfers coming towards you. Falling off the surfboard is a common practice and part of learning to surf. Previously it had been suggested the place for a beginner to surf is in waist deep water, because of this reason when you feel you are falling off the surfboard it is important to try and fall backwards into the wave. Water depth can vary from wave to wave so it is important not to dive in head first, if you do feel like you are going in head first make sure you throw your arms out in front to break your fall. Step off to the back of the surfboard leading with your front leg. Take a couple of steps holding onto the surfboard until your speed has decreased. There you have it. Surfing is all about practice. Don’t worry, it will all come together. Whether you have never been surfing or just would like to know enough to hang with your surfing buddies or plan on getting your own surfboard and joining the mix, our guides has something for you. Now, go get out there in the waves with confidence! Surf's up!